More troubles for the electronics and toys segments. The retail sector is a major contributor to the US economy, accounting for about two-thirds of GDP and employing nearly 16 million people. Five out of the 10 largest retail companies in the world are from the US. Annual retail sales increased 4.5% between 1993 and 2015. 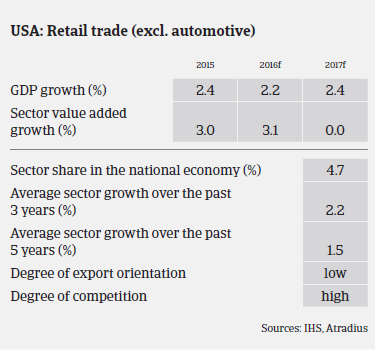 The general outlook for the US consumer durables retail segment remains positive, driven by robust private consumption, forecast to grow about 3% in 2016 and 2017, while inflation is expected to remain low. It is expected that pent-up demand will increase due to improving consumer confidence, relatively low household debt, and falling unemployment. 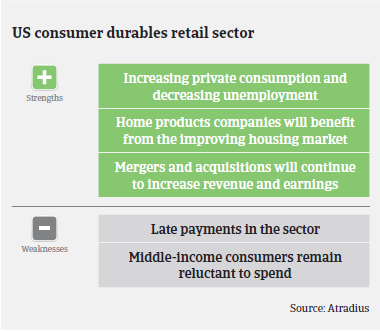 Consumer durables retailers´ aggregate operating profits are expected to increase 5.0%-6.5% over the next 12 months, while revenues are expected to grow 5%-5.5%. In the home-product subsector, appliances and furnishings revenues are expected to grow 5%-7% over the next 12 months, while operating profit is forecast to increase 7%-8%. The consumer products and retail industry continue to consolidate within each segment of the value chain. Merger and acquisition activity will remain robust as companies seek to turn their stable margins and stronger balance sheets into enhanced product portfolios and greater geographic diversity. Especially electronics and toys retailers continue to face steep competition. In both segments competitive dynamics are fierce between online and brick-and-mortar retailers. Online sales are expected to remain the fastest growing segment of the retail industry and shift the retail landscape. Cyber Monday is expected to increasingly drive holiday sales instead of Black Friday. Despite the generally good outlook for consumer durables retail, there is always the risk that sales prices may suffer if demand unexpectedly slows and competition intensifies. While high earners continue to spend, thanks to gains in the housing and equity markets, many middle-income consumers still remain more cautious. Payments take 90 days on average, and we noticed increasing non-payments in the last couple of months. 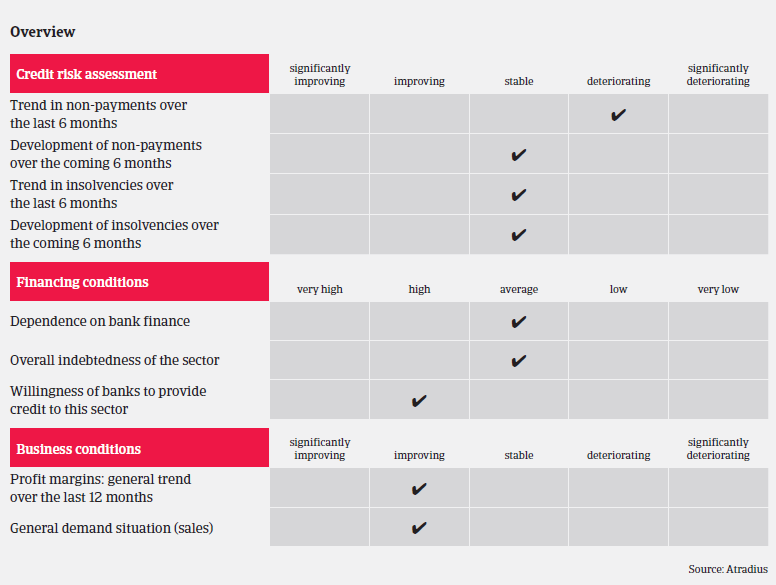 However, we do not expect non-payments to increase further in the coming months. Insolvencies are expected to level off in 2016. Our outlook for the overall consumer durables sector should be viewed as mildly conservative. Despite the general upswing, the consumer durables retail sector continues to be characterised by increased competition and continued price and margin pressure. Therefore, businesses within the industry should be carefully evaluated and liquidity should be closely observed. Specific subsectors are viewed more positively than others: while solid home sales should support demand for furniture and other home goods, we are more cautious on segments like electronics and toys with strong competition.